100% Whole Wheat Bread, I already have a version of it here on my blog, but I was always looking for a better and different version. I was thinking about adding some flax seed powder to the bread dough and then I came across this recipe for whole wheat bread using egg, and of course a little bread flour was used in the recipe. I didn't want to use egg and also I didn't want to use bread flour or all purpose flour, so after trying out a couple of times, I finally arrived at the perfect bread ( at least for the time being, if I find another version, I'll surely blog about it here). I have used organic whole wheat/ atta for making the bread and I have used instant yeast for baking. 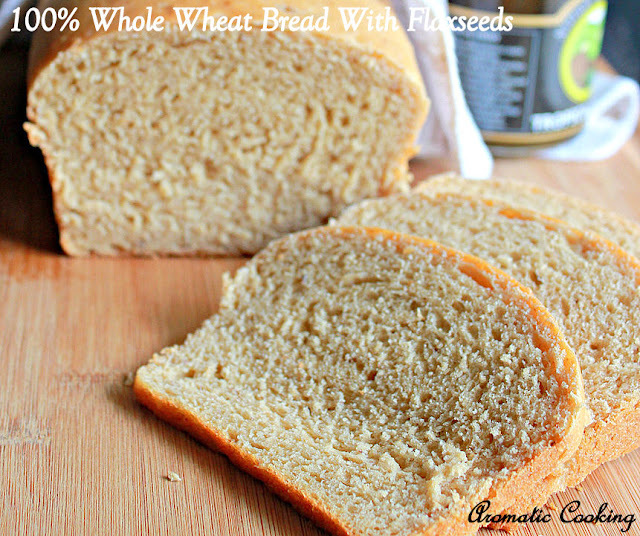 Because of the milk and flax seeds ued, the bread was much softer, less denser and less crumbly than the previous 100% Whole Wheat Bread, do give this a try.. Though I used instant yeast, I prefer proofing the yeast, to make sure that it is still alive, so I added 6 tablespoons of lukewarm water to 2 teaspoons yeast and 1 tablespoon sugar and at the same time added 3 tablespoons of warm water to 1 tablespoon of flax seeds and left both for 10 minutes. After 10 minutes, the yeast should have bubbled up. Now sieve 3 cups of whole wheat flour/atta in a bowl, add the salt, remaining 1 tablespoon sugar, oil, flax seed mixture and the yeast, then add the milk and start mixing the dough, it will be sticky, leave it for about 5 minutes. Clean your hands and take out the dough on a board dusted with very little flour, then start kneading the dough, knead it for 200 times, yes, count while kneading. By the end of 200 kneads the dough will no longer be sticky, but smooth and soft. Shape it into a ball, apply some oil all round, cover and leave it for 15 minutes. After 15 minutes, flatten the dough as shown, then roll it tightly and tuck the ends under to make a smooth loaf. Place it in a greased loaf pan, cover and leave it to rise, till the height of the dough is about 1" above the pan height. Then bake the loaf at 190 C for 30 minutes, half way through, cover the top with a aluminium foil tent to prevent the top from browning too much. Remove, let it cool for 10 minutes in the pan, then remove it and let it cool completely before slicing. You can use active dry yeast ( same quantity ) in the place of instant yeast. For instant yeast, and for the weather now, the quantity of milk given was perfect, while making the dough if it's not slightly sticky at the beginning, then the dough will be a little dry after kneading and the bread will be dry and crumbly and also the dough will take longer to rise. If the weather is very humid, you might not need the extra 1 or 2 tablespoons of milk, or add a little flour while kneading. Kneading the dough is very important, so please don't compromise on that. If you are okay with eggs, then add 1 egg instead of the flax seed powder. I bought it from Bakersmart, you can order online, since I am in Bangalore, I ordered and got it picked from the store. That's a perfect sandwich loaf! 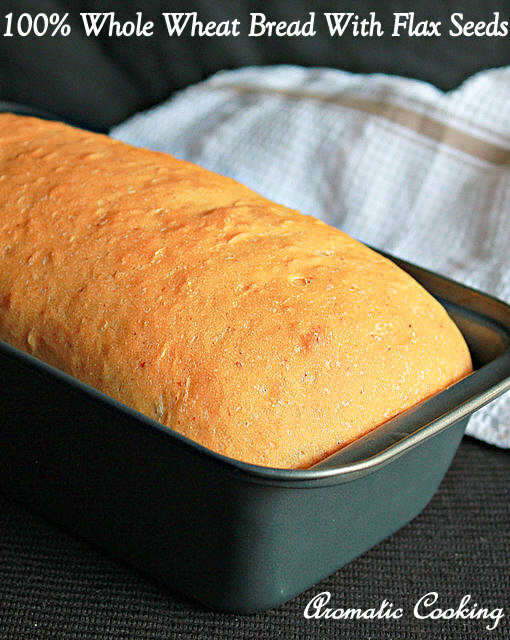 This whole wheat bread looks so perfect to make sandwiches. Healthy and looks moist. Thanks for sharing. Currently making thee bread right now. Must say I hope it turns out as lovely as yours did! So excited to see how it looks and tastes!